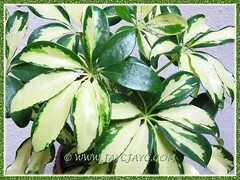 We were captivated by this gorgeous looking variegated plant with green, off-white to yellow colouration! Wouldn’t you be dazzled by it too? We came across this beauty at a garden nursery in our neighbourhood about 4 and a half years ago, in November 2011. 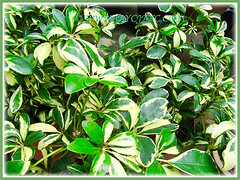 As always, we simply love plants with variegated foliage and decided without hesitation to purchase a pot of it to include in our garden collection. It will surely be suitable to be located at our courtyard where mostly variegated plants are housed. 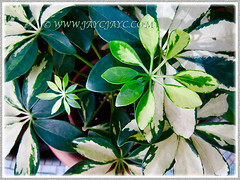 Botanical Name: Schefflera arboricola ‘Janine’. 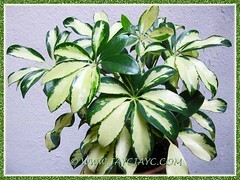 Common Names: Janine Schefflera, Dwarf Umbrella Tree, Hawaiian Elf Schefflera. Etymology: The genus, Schefflera is named in honour of Johann Peter Emst von Scheffler, a physician and botanist of Poland. Origin: Schefflera arboricola is native to China and Taiwan, whilst Schefflera arboricola ‘Janine’ is a cultivar. Features: Schefflera arboricola is one of the many species in the genus, Schefflera which has over 700 species. A dwarf variety with medium growth habit. It is a hardy and evergreen tropical perennial. 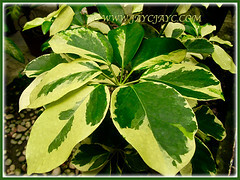 It produces captivating small lime-green leaves that are mottled from creamy white to yellow. Leaves are palmate, fingers-like with five to seven lobes whose midribs all radiate from one point. The elliptic leaves with entire margin are leathery, thick, smooth and glossy. They are held by flexible green petioles and arranged alternately along the stems. This plant does produce green flowers and fleshy orange-yellow fruits occasionally. 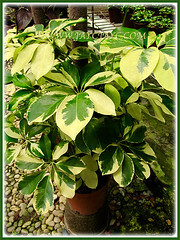 Culture (Care): Schefflera arboricola ‘Janine’ or Dwarf Umbrella Tree grows easily with least maintenance. Light: Full sun, filtered sunlight or semi-shade, outdoors and medium to high light, indoors. Moisture: Low to medium water requirement. Can be drought tolerant when well established. Soil: Grow in humus-enriched, sandy/loamy and well-drained soil with good aeration. Others: Remove withered leaves to keep the plants tidy and aesthetically pleasing. Prune it back occasionally by pinching the stems to form a denser shrub. Feed once monthly with a balanced houseplant fertiliser. No known serious pests or diseases though do watch out for mealybugs, spider mites and scale. For subtropical and temperate regions: Hardiness: USDA Zone 10-11. It is cold hardy to -1.11°C for a short time. Since it is not frost tolerant, do provide protection if necessary. An eye-catchy perennial in hardy regions. Water regularly during the growing season in summer but reduce gradually after. 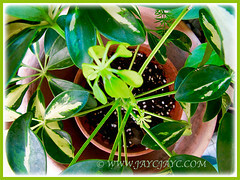 Feed in spring and summer with a balanced houseplant fertiliser once fortnightly but reduce to once monthly in winter. In non-hardy regions, grow it as a potted houseplant so that you can overwinter indoors and bring it outdoors once the weather is warm. Provide sufficient bright light, warmth and humidity if grown indoors. Propagation: By cuttings and marcotting or air layering. Can be propagated from seeds (not easily available) but may not get the true features of the parent plant. 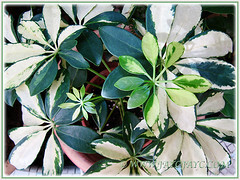 Usage: Schefflera arboricola ‘Janine’ or Dwarf Umbrella Tree with dramatic variegated foliage will make an excellent ornamental specimen in any garden. A captivating plant that provides the ultimate tropical look for your garden. Most ideal for growing in pots and raised planters. This plant is popularly used as bonsai because of its beautiful aerial roots that emerge from the lower portion of the trunk and root into the ground. Great as an eye-catchy houseplant for indoor decor, especially in non-tropical climes or located at patio and deck, outdoors. Also ideal as an indoor plant as it is known to purify or filter air pollution.